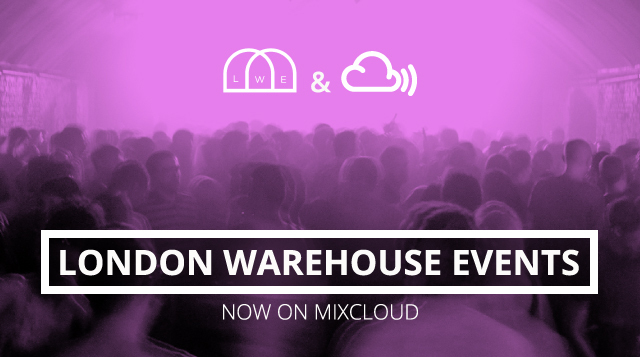 Announcing our partnership with London Warehouse Events – The global community for audio culture. We are delighted to announce a media partnership for 2013 with our friends London Warehouse Events. LWE have rapidly established themselves as one of the biggest cross genre promoters in London. As part of this partnership they are curating a fresh and innovative mix series on Mixcloud, showcasing cutting edge mixes across a broad spectrum of electronic genres. The partnership will also include a number of high profile DJ contests and lots of ticket giveaways for the Mixcloud community! A match made in heaven. To get yourselves onto the Mixcloud guestlist for these shows, email competitions@mixcloud.com with the subject line “Mixcloud LWE Friday” or “Mixcloud LWE Saturday” and include all names for the list in your email. Also a final reminder – we’re running a DJ comp with them to win a set at their massive 3rd birthday celebration. The competition closes tomorrow – go here for more information and to check out the entries so far. And we wouldn’t leave you without some listening recommendations for this weekend – check out this Playlist of DJ sets and radio shows from artists playing at the Joker vs Skepta takeover on Saturday!